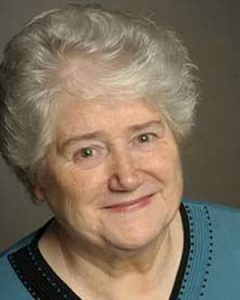 Frances Blackburn is a native of Dublin where she was introduced to the Theatre as a young child. She attended speech, drama and dance classes as well as studying Piano up to Grade 6. Her interest in the Theatre led to her receiving an LLCM(TD), an LTCL plus a diploma in Theatre Studies from Maynooth University. She worked constantly with children in schools, teenagers in Macra Na Feirme and amateur drama groups on a voluntary basis. During this time she furthered her education by studying with professionals in various aspects of Theatre for one week each year. This led to her being offered posts in Germany, Austria and Canada working with teenagers studying to be professional artists. Frances has worked at the Gate Theatre and the Focus Theatre. She has played Big Maggie and Cass Maguire in the Balrothery Inn, Co Louth. Her television work includes Fair City, Kilnaskully, a docudrama called Fallout and a TV film called Little White Lie. She has also done voiceover work and television advertising for Jacobs Biscuits, Lyons Tea and The National Lottery. Big Maggie Big Maggie Bob Gilbert Swords C.C. Improvisation: Chrissie Poulter, Des Braiden, Tommy McArdle. Kate Canning, John P. Kelly. Movement in Character: Scott Marshall. The Poor Theatre: Martin Drury. Comedy: Des Braiden, Betty Ann Norton. Shakespeare: Chrissie Poulter. Synge, Yeats & Gregory: Conal Morrison. Voice and the Actor: Paul Mouselides. Stanislavski Method: Joe Devlin. ‘The Actor and Director in Rehearsal and Performance – A Collaborative Relationship’ – Mark Travis. Delegate at the 1st World International Congress on children’s theatre. “Theatre Work with Children in Ireland”.Lingen, Germany. Building life size puppets in Vienna. Musical Theatre Summer School, Canada.